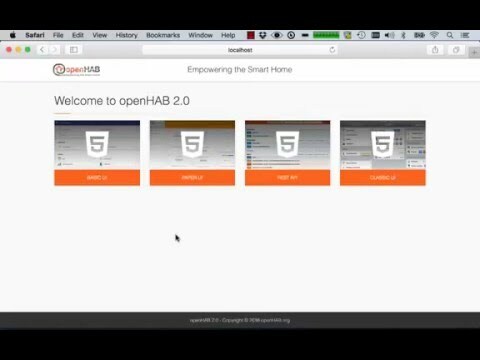 openHAB offers different UIs in its standard configuration: the Paper UI, the Basic UI and the Classic UI (this has to be installed manually from within Paper UI or via config file). Thing discovery: See devices and services found on your network and add them to your setup. Linking items to channels: Instead of adding a binding configuration to your item file, you can directly link Thing channels to your items. Note that you still need to define your items, sitemaps, persistence configurations and rules in the according configuration files (as done in openHAB 1). Such functionality will be added bit by bit to the Paper UI only. All these aspects are explained in the rest of this tutorial. The Basic UI is a web interface based on Material Design Lite from Google. This interface is used to present the different sitemaps. 1: as for now, only control states and icons are updated. Visibility changes require a page reload. The Classic UI offers the same services that the Basic UI but with a different look and feel, close to an old iOS one.